Quad Fish - AKA "The Quan" or "The Speed-Dialer"
Design: Quad Fish ("The Quan", A.K.A. the “Speed-Dialer”, A.K.A. the “Dish”). "Once beyond now obtainable". 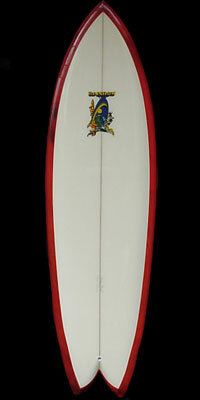 Modern evolution of the Classic Fish up to 8’0”. Contemporary rocker, low entry, slope rail, slight concave deck, beak nose, double into single barrel afterburner! The Quad Fish is the "Board Of The Decade" for very good reasons. More press and buzz is surrounding this board like never before. Don't be left behind in the lineup,... literally. Get all the speed you want! Flyyyyyyyy.